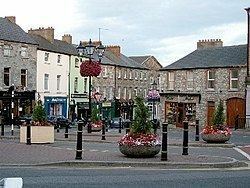 Navan (; Irish: an Uaimh) is the county town of County Meath in Ireland. In 2016, the town and its environs had a population of 31,689; making it the 5th largest town, and 10th largest urban settlement, in Ireland. Navan is along the River Boyne and the confluence of the Blackwater and the Boyne is situated in Navan. Navan is one of the world's few towns that has a palindromic name. Variants of Navan had been in use since Norman times. It is thought to come from Irish an Uamhain, meaning 'the cave/souterrain', a variant of its more common Irish name an Uaimh. In 1922, when the Irish Free State was founded, an Uaimh was adopted as the town's only official name. However, it failed to gain popularity in English and in 1971 the name was reverted to Navan in English. Tara Mine, Europe's largest lead and zinc mine is located in Navan. The town traditionally was famous for carpets (Navan Carpets closed in 2003) and for a thriving furniture industry (Beechmount Home Park). Both are now in decline, or have ceased, as a result of the move away from manufacture to cheaper locations like Eastern Europe. 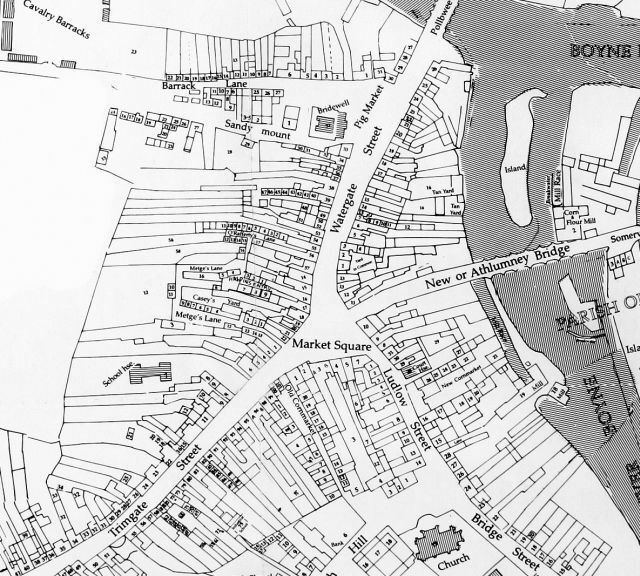 Nevertheless, Navan had rapidly expanded with the Celtic Tiger to become a large dormitory town due to its proximity to Dublin, in particular the Johnstown area to the south of the town. Following the Global economic crisis and the collapse of the Celtic tiger in 2008 Navan once again declined. Employment in the mining industry remained stable however tertiary industries reliant on consumer spending suffered. The town has a freight only railway line which passes the former Navan railway station. 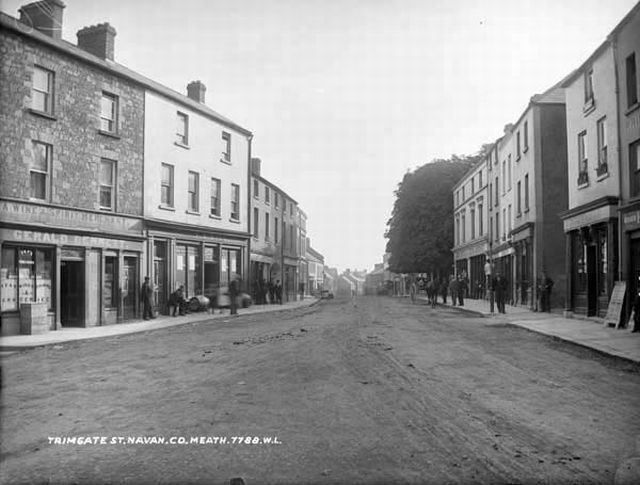 Navan was a railway crossroads, with the GNR(I) line from Drogheda to Oldcastle and the MGWR line from Kingscourt to Clonsilla (on the Dublin to Sligo line) passing through the town, connecting at Navan Junction. The GNR(I) line from Navan to Oldcastle and the MGWR line from Clonsilla to Navan closed in 1963, leaving the lines from Drogheda to Navan and Navan to Kingscourt in place. A spur to Tara Mines on the Navan to Oldcastle trackbed was reinstated in 1977. As of 2005 the railway is solely used by Iarnród Éireann to bring freight from the local lead and zinc mine, Tara Mines, to Dublin Port. The line from Kingscourt was used for transport of gypsum until quite recently but now this line is unused. A campaign to have the Clonsilla to Navan line reopened, seeks a commuter service to Dublin, initially via the existing Drogheda line, and then directly through reopening the direct line to Dublin via Dunboyne. The Transport 21 plan envisaged the reopening of Clonsilla services happening in two stages, initially to a park and ride off the M3 at Pace by 2009 and later extending to Navan by 2015. The first stage of the project as far as Pace, Co Meath was completed in 2010, and a daily commuter service to Dublin Docklands Station commenced on 2 September 2010. The second stage of the rail link to Navan has been postponed indefinitely as a consequence of cutbacks in the state's infrastructural spend announced in July 2010. Navan is served by several bus routes. However the town as of yet has no central bus station and there are four separate stops in the town, with different routes serving each (Market Square, Mercy Convent, Shopping Centre & Fire Station). The majority of routes are operated by Bus Éireann. The most frequent route is the 109 to Dublin which departs from the Market Square. Sillan also serve the town. Royal Breffni Tours provide services to Dundalk Institute of Technology. Streamline Coaches provide services to NUI Maynooth. Navan has a number of secondary schools, including private denominational and public inter-denominational and non-denominational. St. Patrick's Classical School is a Roman Catholic boys-only school. Loreto Secondary School, St. Michael's at the Loreto Convent, and St. Joseph's Secondary School at the Mercy Convent are both girls-only Roman Catholic convent schools. Coláiste na Mí is a VEC-run school in Johnstown which opened in 2013. Beaufort College is a large state- owned inter-denominational vocational school. The Abylity Secondary College was a parent-owned fee-paying non-denominational school. Navan and the surrounding area has a number of primary schools, including the town's Catholic boys' primary school Scoil Mhuire which was originally run by the De La Salle Brothers. Pierce Brosnan was a former pupil of St. Anne's Loreto which is situated beside St. Mary's Catholic Church and near to St. Joseph's Mercy. There are also St. Paul's, St. Ultan's, and St. Oliver's primary schools. Scoil Éanna is the town's only gaelscoil. The town's only Church of Ireland secondary school, Preston School, closed in the 1970s. It is now the site of the shopping centre in the town. There is a Church of Ireland primary school known as Flowerfield School, at Connolly Avenue, a new site. It was originally situated at the Flowerfield area of the town, on the main thoroughfare to Drogheda, in a building which has been sympathetically converted into private accommodation. There is also a multi-denominational Educate Together primary school in the town, sited at Commons Road. Navan was the childhood home of Pierce Brosnan, who went on to play James Bond. TV personality Hector Ó hEochagáin, and comedians Dylan Moran, Tommy Tiernan and comedy writer Arthur Mathews also hail from Navan. Other famous Navan people have included Sir Francis Beaufort famous for the development of the wind scale. His birthplace was removed by the local council in the 1990s to make way for a road junction. Leading Trance producer John O'Callaghan is also from the area. Entrepreneur Ian Clarke, the man behind Freenet, Revver and SenseArray is also a Navan native. Clarke's family owns The Sports Den, which is currently operated by his brother Simon. Walterstown GFC founded in 1902 on the outskirts of Navan have 5 Meath Senior Championships & 2 Leinster Senior Championships to their name. The club is now recruiting players, male & female in all agegroups from Nursery (4) to Senior. Navan O'Mahonys GAA was founded in 1948 and have won 17 Meath Senior Football Championships. Simonstown GFC & Bective GFC are two additional Navan based clubs. Páirc Tailteann is located in Navan and is home of the Meath Gaelic football and Hurling teams. Knockharley Cricket Club were founded in 1982 and are the only cricket club in County Meath competing in the Leinster Cricket Union, the clubs most recent success came in 2006 when the 1st XI won the Middle 2 Leinster Cup defeating Mullingar at North Kildare. Parkvilla Football Club was founded in 1966 and currently plays in Leinster Senior League division 1B. They have a very successful schoolboy/girl section which has consistently won the highest honours in the North Eastern Counties Schoolboy League. The club was honoured with a Civic reception by Navan Town Council in 2006 for their contribution to sport and the community in Navan and the Parkvilla Belles (girls team) also achieved the same honour in 2014 when they became the last sports team to receive the honour before the disbandment of the Town Councils. Their home ground is Claremont Stadium, Commons Road, Navan whom they co-own with Navan Athletic Club. Johnstown Football Club, OMP, Navan Cosmos and Navan Town are other football clubs which are based in Navan. Horse Racing, both National Hunt racing and Flat racing, take place at Navan Racecourse. There is an initiative to twin Navan with Navan, Ontario, Canada which was given its name by Michael O'Meara from Navan, County Meath, who set up a trading post in Canada in the 1840s which became a Post Office called Navan. Navan, Ontario is now a village on the outskirts of Ottawa with an approximate population of 3500 people. The Navan2Navan Community Initiative was set up in 2012 to develop links between the two towns. Railway Street in Navan is the home of the Solstice Art Gallery, which is run by Meath County Council and leading art exhibitions are held there regularly. Meath Arts Group is very active in the area. Sniomh by Betty Newman Maguire in front of Navan Fire Station. A sculpture inspired by the movement of water and the merging of the rivers Boyne and Blackwater. The Fifth Province by Richard King on the Navan Bypass. A sculpture symbolising the ideal for the cultural integration of all the people of the island of Ireland. Composed of four branches and a central upright stem that symbolises the flowering of hope and peace. The Bull design by sculptor Colin Grehan is a prominent piece of public art. Situated in the Market square of the town the 16 tonne limestone statue of a bull being held back by two handlers commemorates the historic bull markets that took place in the area. The statue was surrounded by controversy over its cost, an estimated €8.7 million, and its location. Local man Paddy Pryle noted that "anybody coming up Timmons Hill, which is one of the main entrances into the town, will be entering Navan via the bull's arse. It is one of the most crazy things I have seen put up yet," Objections to the statue delayed its erection by 8 years. Blackwater Park is situated on a 28 hectare (66 acre) site at Abbeylands, Navan between the Windtown Road and the River Blackwater. Navan Blackwater park has a wide amount of facilities such as Rugby Pitch, Football Pitch and a Gaelic Pitch it also holds a children’s playground they are just the present phase of development. Meath County Council has the intention to continue to invest to develop further facilities in the park. Blackwater Park held its first 5k park run in 2016. The park run was organised by volunteers and it was a free event.